During the summer we can experience some warm and even hot days (we are generally 10° cooler than the temperature in Wenatchee), but because of our elevation, we receive pleasantly cool evenings even in July and August. So while you may enjoy shorts and a t-shirt during the day, you may be comfortable in a sweater or light jacket in the evening. Being so near the crest of the Cascades means the weather can change frequently throughout the day: we consider this variety just another wonderful aspect of living where we do! Because we are located in the mountains, we do receive snowfall and generally have up to a couple feet on the ground at any given time throughout the winter season. We generally start to see snow by late November and it can stay with us all the way to March or April. This is wonderful for wintertime recreation such as skiing, snowshoeing and ice skating, but we do realize it can be a concern for those who aren’t accustomed to getting around in the snow. Rest assured: Kahler Glen has a dedicated crew of snow plowers standing by all winter long to keep our roads and drives clear, and Stevens Pass/Hwy 2 is kept in wonderful condition by the WSDOT. The eastern slopes of the Cascades are thick with Douglas fir and Ponderosa pine trees, accented by wildflowers in the spring/early summer and the stunning foliage of vine maples and aspens in the fall. Our scenic setting provides a front-and-center seat to all sorts of mountain wildlife as well: from eagles and songbirds to deer and even the occasional moose – living with wildlife is a way of life here at Kahler Glen. 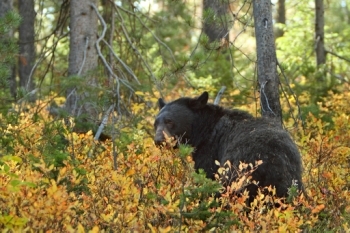 Regarding Bears: Yes, we do have black bears in the vicinity, but our experiences with them have never amounted to much of anything (other than footprints across a freshly watered green). They are mostly active from dusk until dawn, where garbage cans and dumpsters serve as attractants for an easy meal. They are beautiful animals to be sure, but they are truly wild and should never be approached. In fact, once they are aware of your presence or hear you coming, the vast majority of the time they will bolt directly into the woods to get away.